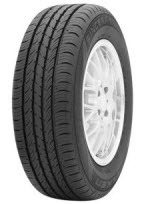 Falken Sincera SN-211 touring tires take an 80,000 mile tread design and mix it with performance and all-season driving to come up with a tire that runs well in all types of weather, and it does it very quietly. Built as original equipment on many of today’s best selling coupes, sedans and wagons, the SN-211 is also available as a replacement tire. Dry and wet pavement traction is enhanced through four circumferential grooves and sipes that vary in depth along the tread. This also helps give it a longer tread life. Squared shoulder blocks and a serrated sidewall design work well together in helping this Falken tire corner much better than others in its class. Inside the tread are twin steel belts and a compound that virtually eliminates any road noise. Tread wear indicators makes it easy to track tire wear and know when you need to rotate the tires. Overall, the Sincera SN-211 is a good performing tire that offers some nice features and an excellent tread life for those looking for a long lasting tire. Prices on the Falken SN-211 tire range from around $80 on the 14 inch series to approximately $145 on the larger 18 inch series tires. Who Are Falken Sincera SN-211 Tires Designed For? Falken has developed the Sincera SN 211 for drivers of coupes, sedans, minivans and other types of vehicles who want a long lasting year round tread design that sports performance and comfort. Falken warrants the Sincera SN-211 with an 80,000 mile tread life guarantee. This is among the longest in the industry. You will also get a first 2/32 inch of wear on tire uniformity.